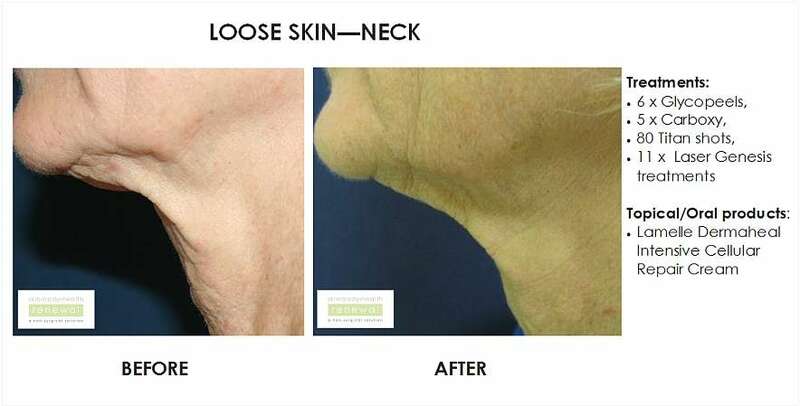 One of our most popular and effective tightening treatment use for lax skin is the Titan®Skin Tightening treatment as well as Exilis Elite, which can be done in combination with numerous other treatment modalities for optimal results. At Skin Renewal, we offer topical therapies such as the Lamelle Dermaheal Growth Factor range, for lax skin rejuvenation. Once the signs of ageing appear on the facial skin, it is time to initiate the most powerful corrective treatments and topical therapies available such as growth factors to improve collagen content. Skin and Body Renewal is excited to offer the next step in multi-modality therapy in treating skin laxity. Any treatment modality on its own can make a big difference, but in our eyes it's not sufficient. Skin laxity has different forms and grades and thus success at combating it needs a combination of treatments that include physical collagen contraction, and long term collagen stimulation. We offer Carboxytherapy in combination with skin tightening procedures such as Exilis Elite, Titan®, TriPollar™, Accent and Velashape™ in producing some really significant results. Transdermal mesotherapy treatments with Dermaheal growth factor solutions are also an option that can be included in our treatment packages to ensure superior collagen stimulation. Virtually any patient in their thirties or above can be a candidate for a little tightening and firming and the younger the patient the better the result. Eight out of ten patients get noticeable improvement in skin laxity after their first treatment, and ten out of ten will be putting collagen "in the bank" for the future. The new concept today is to start with tightening rejuvenation treatments early so as to avoid or postpone surgical solutions for as long as possible. If one can keep one's skin firm and taught with collagen, then the sagging that takes place over time can be contained as tighter facial skin supports the body. So, start with rejuvenation treatments early so as to and avoid the inevitable ageing. At Skin Renewal, a highly professional team led by a medical doctor assesses every patient and an appropriate combination treatment package is put together with a long term maintenance program to provide every client a fully customised solution dependent on expectations, budget, time and medical conditions.